With the weather that battered so much of the UK last week came the inevitable clear-up operation at golf clubs that found themselves submerged. I’m sure there were plenty of fallen trees and damaged buildings to contend with as well. Across the Pond, our American cousins have been suffering too– weather it’s the Californian droughts or the Polar Vortex, they have taken quite a bashing. And alas, one of the most famous trees in the game of golf has fallen victim. 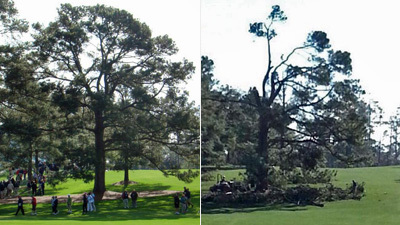 Augusta National’s ‘Eisenhower Tree’ succumbed to a particularly harsh ice-storm last weekend and with it went a slice of golfing history. ‘Ike’s Tree’, as it is also know, was a loblolly pine famously located some 210 yards up the left hand side of the 17th fairway. Its fame, or infamy perhaps, was a result of Augusta National member and US President Dwight D. Eisenhower’s regular troubles trying to negotiate a way around it from the tee. Having hit it so many times, so the story goes, Eisenhower campaigned for the tree to be cut down at a governors’ meeting in 1956, but Clifford Roberts, the then Chairman of Augusta National, promptly adjourned the meeting. Tales vary as to exactly what transpired – the official version was that this was his tactful way of overruling the President’s request, while there’s also a version whereby the notoriously cantankerous Roberts (who was also a close friend of Eisenhower’s) retorted something along the lines of “You run the country Mr President and I’ll run the golf club”. Either way, the moniker ‘Eisenhower’s Tree’ soon followed and entered golfing folklore. So, what to do? For most golf clubs – and I’m excluding Augusta National in this as they can no doubt afford to helicopter in a fully grown pine to replace it, if they choose to – I assume the choice boils down to an acceptance that Nature has taken its course and made a revision to the course design, or the planting of an affordable sapling that will one day (in a few decades time) serve as a worthy replacement. The loss of a mature tree can entirely change the feel of a hole – in some cases, even an entire club if it was particularly iconic. Whether to replace it or not becomes an important decision when it’s integral to the nature of the hole and they way it’s been designed. Sadly, I suspect that empty coffers at many golf clubs make such a decision for them. It will be interesting to see what approach is taken by the committee at Augusta National. Apparently, for many years there’s been talk among the men in Green Jackets as to what they’d do should such a day come. So, I guess they have a contingency plan and we’ll wait to see if there’s a replacement tree ready to be parachuted in. In the real world you’d imagine it impossible to have anything in place in time for The Masters (seven weeks away), but given the influence of the powers-that-be at Augusta, nothing would surprise me.